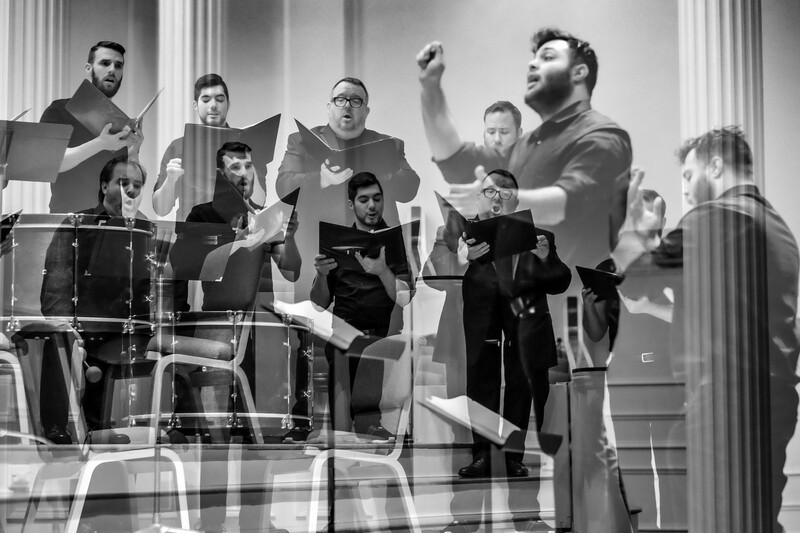 The Verdigris Ensemble is a relatively new choral group that's looking to introduce choral music to a modern audience using creative concert programming, technology and a nontraditional use of space. The Verdigris Ensemble is a North Texas choral group made up of singers from around North Texas (Dallas, Denton, Arlington and Addison). They're led by the group's founder and artist director Sam Brukhman. 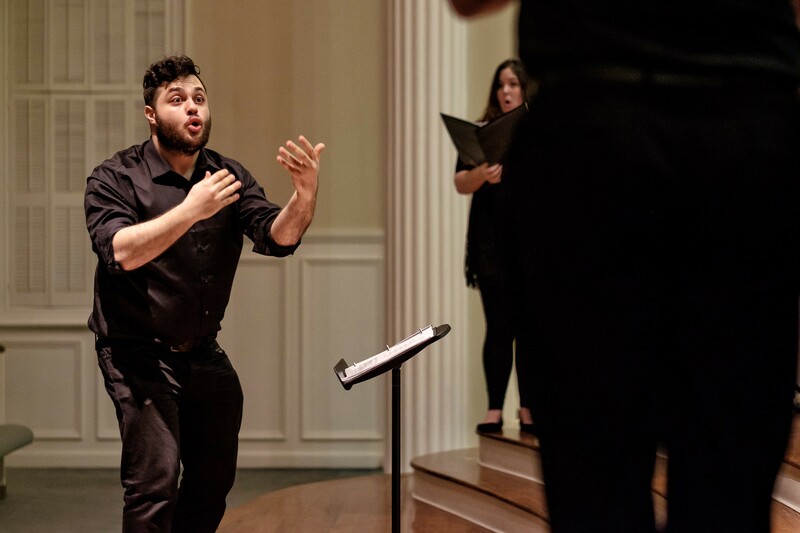 Brukhman's a New Jersey native who studied at Westminster Choir College in Princeton. 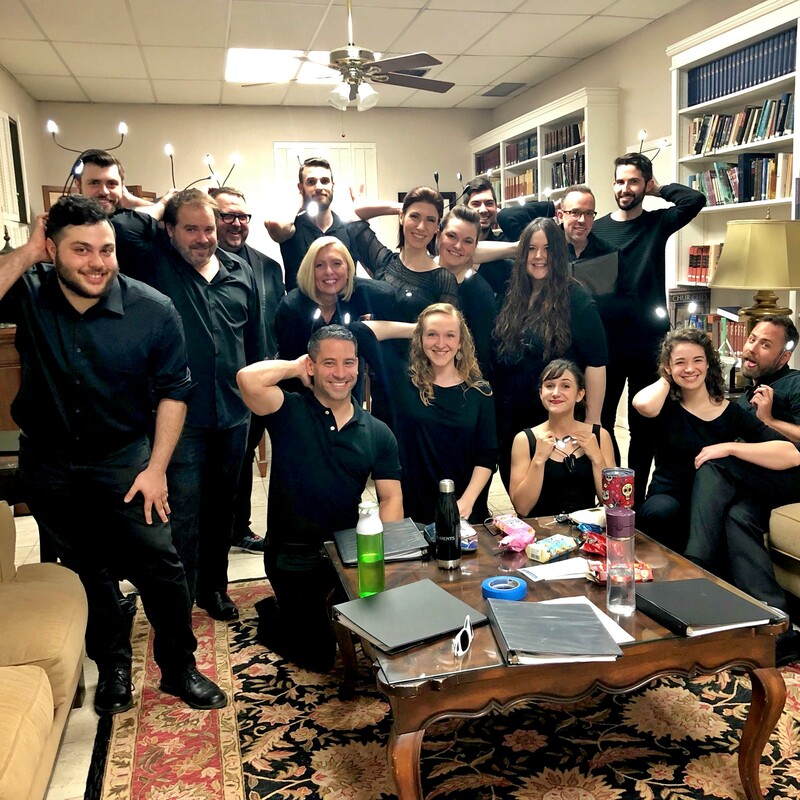 The group's goal is to introduce choral music to a modern audience using creative concert programming, technology and an nontraditional use of space. In 1968, NASA launched Apollo 8 – the first manned spacecraft to orbit the moon and return to Earth. 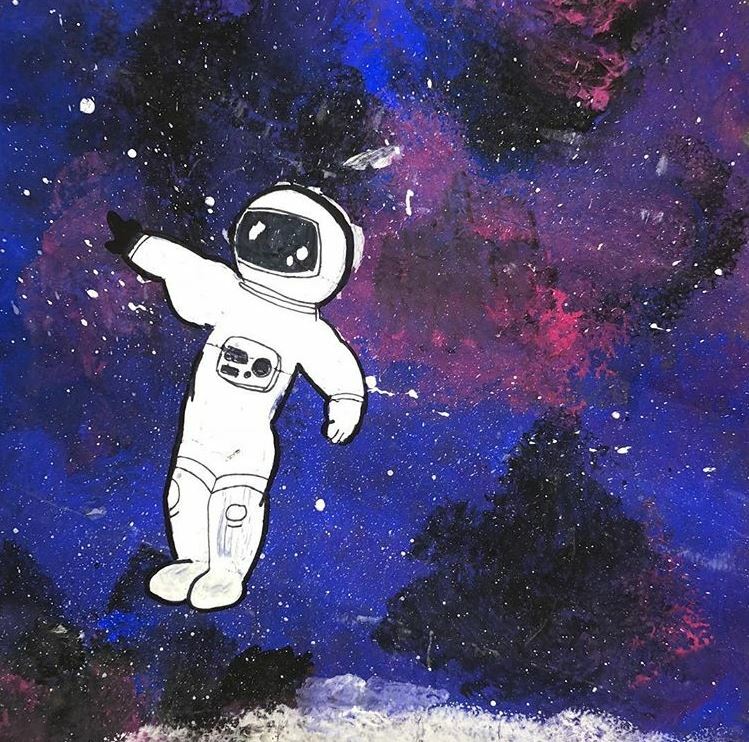 In this week’s Art&Seek Artist Spotlight, the Verdigris Ensemble, a new North Texas choral group, takes me on an interstellar journey inspired by that trip nearly 50 years ago. It’s a Tuesday night inside Royal Lane Baptist Church in North Dallas. And the Verdigris Ensemble is rehearsing a piece called “Panda Chant.” The song’s just one part of a larger program they’re performing this spring called “Consolation of Apollo.” And “Panda Chant” has a lot going on. Promo poster for “Consolation of Apollo.” Drawing by Arina Gart. Members of the choir are chanting the word “panda.” Others are chanting “duh, duh,duh, duh.” There’s some stomping, yelping and other peculiar sounds. “Panda Chant” is by the avant-garde, American composer Meredith Monk. Verdigris’ founder and artistic director, Sam Brukhman, chose it for its cosmic sound. “It’s the closest thing you’re going to get to traveling to space,” he says. Brukhman wants that interstellar sound to help audiences blast off and imagine life in the stars. He says a choral performance about outer space should take you out of this world. Brukhman’s 25. He teaches choir in Forney. He started Verdigris a year ago, naming the group for the blue-green patina that can form on copper. It’s his mission to make contemporary choral music more popular by crafting programs that seem like performance art. 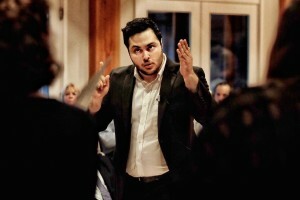 Sam Brukhman conducting the Verdigris Ensemble. 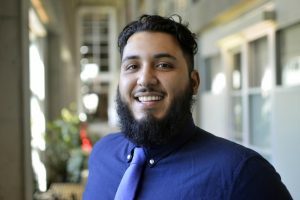 Brukhman moved here about three years ago from Princeton, New Jersey. That’s where he earned a music degree from Westminster Choir College. Other conductors spoke highly of the school choirs in Texas. 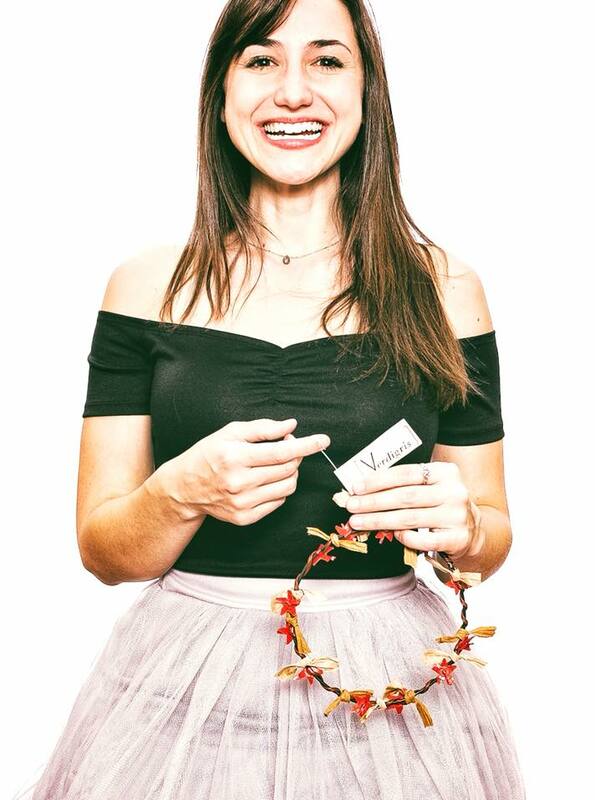 “The first time I stepped into a choir room with an advanced choir [in Texas], I was like, ‘OH MY GOD! WHAT HAVE I MISSED MY ENTIRE LIFE?!? This is crazy. This is absolutely nuts, because you don’t have this standard anywhere else in the United States.’ I mean truly, it’s amazing,” Brukhman says. That’s how Brukhman talks, especially when he’s discussing choral music. His eyes widen, he smiles, energy spills out of him. Brukhman is amazed by the numerous local youth choirs and adult ensembles like the Orpheus Chamber Singers. Still, he felt North Texas needed a different sort of choral group. That’s how Verdigris was born. Brukhman wanted an ensemble that didn’t sound like what you’d hear at Sunday church service. 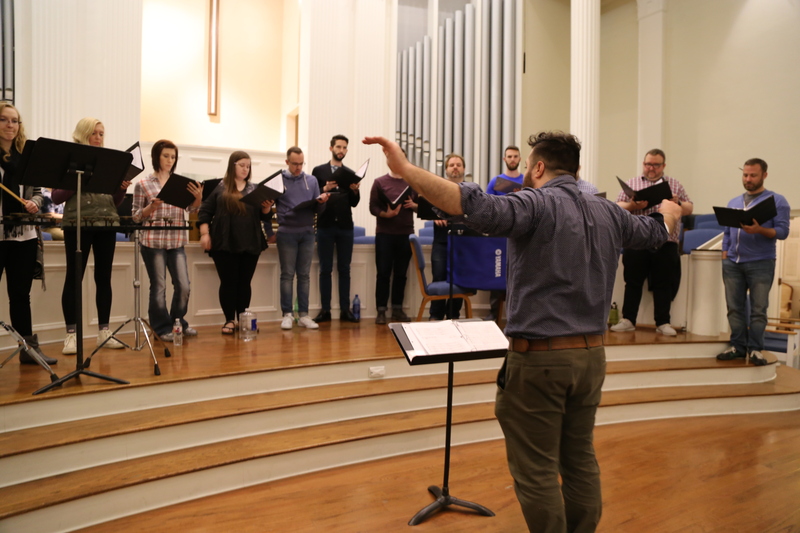 Instead of hymns, his group performs music made by composers regarded as the the Bowies and Byrnes of choral music. What inspires him? 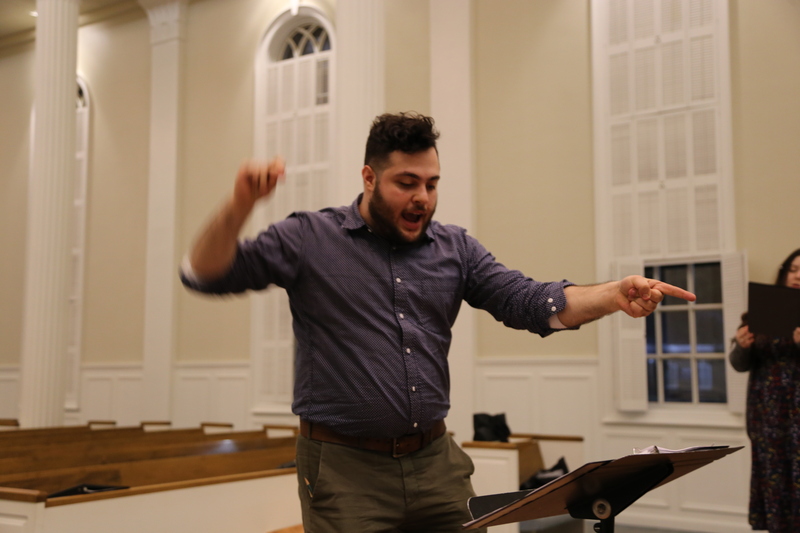 Jonathan Greer’s a member of several local choirs including Verdigris. Verdigris also embraces nontraditional performance spaces. They have to bring their music to the people. In April, they will sing at the Perot Museum and the Planetarium at UT Arlington. 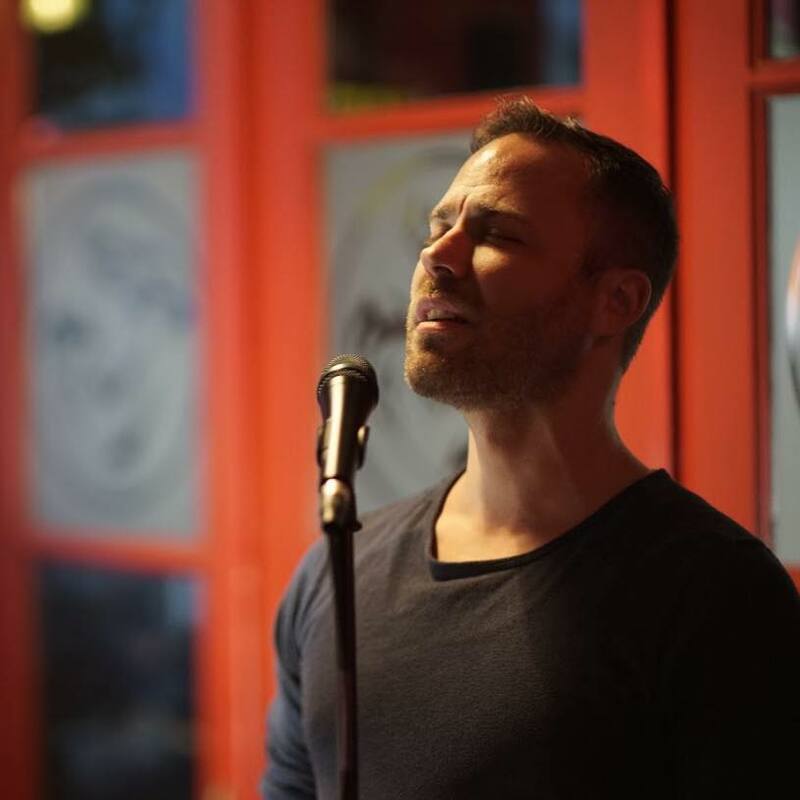 “He’s really great about providing an innovative way to story tell through music,” says Jonathan Greer. Greer’s part of the ensemble, but he also sings in a couple choirs across North Texas. He says there’s another reason Verdigris is unique. Brukhman is open to collaboration. Lauren Stroh, who’s also part of the choir, agrees. Singer Lauren Stroh is also a member of the Verdigris Ensemble. Recently after a performance of “Consolation of Apollo,” I spotted an audience member who was crying. Her name’s Cone Johnson. She said the performance really got to her. Johnson admits that she doesn’t attend many choral performances, but she says she was impressed by this. Johnson says she’ll tell her friends to go to the next Verdigris performance. And that’s good news for Brukhman. Like his group’s namesake, he wants to be around long enough to add a little color and texture to the choral scene. How does being in North Texas effect the production of your art? Well, let’s start with where we are. We’re inside Royal Lane Baptist Church right now. This is where we rehearse. And so far most of the places we’ve performed are also churches. So that’s one thing that sticks out. In Texas, especially in Dallas, the churches have really great acoustics. So a lot of the ideas that we’ve presented at our concerts have been based on the acoustic spaces we’re working within. And that’s something that you legitimately would have a hard time doing in New Jersey, where I’m from, or Philadelphia. A lot of those churches are really old, like hundreds of years old. And they’re smaller. But these new spaces are built for this. They’re large and they have great acoustics. They give me a lot of space to engineer interesting programming. Also, I think North Texas affects the production of what we do because what we do something that really doesn’t exist here. So we’re trying to fill a need. Like I am programming choral performances and selecting pieces that I don’t think other would be interesting in taking on. Does that make sense? Like “The Consolation of Apollo.” It’s a piece of music that was made and performed only in the Northeast. But we’re one of the only ensembles trying to bring this stuff to the South. I guess we’re trying to exist in a genre that doesn’t really live here. Sam, you’re the artistic director of this company. And you’re trying to bring new and modern choral music to North Texas. But what do you listen to? Me? Personally? Oh, Hady. I listen to everything. I listen to the sorts of things you wouldn’t expect someone like me to listen to. If I were to show you my recently-listened-to playlist on my phone – (pulls phone out of pocket) – I’m going to tell you what I’ve listened to. OK, I’ve listened to everything from classical music to hip-hop…from hip-hop to straight up weird stuff, like French rap, dance or whatever. I’m all about sound experience. To me, music doesn’t really have to have a cohesive path. It can be a bunch of tin cans bouncing around, so long as it means something. The genres I listen to are really just based on the listening experience. And actually, while I am talking about this, I am thinking about my programming for Verdigris. So when we perform the choir walks through the audience, we interact with the space, we line up in different positions, there’s choreography. All of that is about the experience. Almost a week away from our performances in @cityofplano and @cityofdallas. Let’s fill the seats! These performances are not complete without YOU! Link in bio. You’re a middle school choir teacher and you lead an ensemble. How do you maintain balance? Well…I take lots of naps. I try to just not do work all the time. But that’s hard. You know, I’ve started up a nonprofit and that takes so much time and so much focus and energy. Everything needs to come from me. There’s not really anyone else. So it takes a lot. But napping, good food, hanging out, reading and taking walks really helps. When did you begin calling yourself a conductor? I’m not sure I really call myself one now. I mean, I’m facilitating. But I don’t think I’m in a position to call myself a conductor, because I need more seasoning. It’s really just experimentation right now, working with things and seeing what works. Right now, I really just think that I’m a learner. I’m just trying to figure things out. The ensemble rehearsing and being led by Brukhman. Yes, especially when I get to do the performances. Like our most recent performance was great, because it felt a lot easier, and a lot more satisfying, because all of the singers have had at least one performance under their belt. They felt confident and it felt like we were communally making music together. So yeah, I feel really satisfied. You moved to North Texas from New Jersey to kick start your career. The choral programs in schools were attractive and the vibrant arts scene made things seem possible for you. But what have you had to sacrifice to be here? Oh my God, I might start crying. OK. My grandma immigrated to the U.S. from the Soviet Union in 1993. That’s the year I was born. And she used to teach piano. It was something she tried to teach me back when I was a rebellious youth, but I stopped. The more I’ve grown and I’ve aged, I’ve realized how much of a helpful teacher and instructor she’s been to me. So I guess the biggest sacrifice that I’ve made is moving away from her. She lives in the old Jewish part of Brooklyn and every time I visit her I think, ‘Time is running out and I need to spend time with her or I am going to regret it for the rest of my life.’ But that’s the biggest sacrifice: not being able to be with my grandma. Brukhman leading the Verdigris Ensemble. Do you have routines or practices that you turn to for your programming? Yeah. It all starts with words. So I have a notebook that I write all of my ideas in. I could be writing words, poems, lyrics and names of paintings – basically anything that inspires me. From there, I sort of make a collage and I try to figure something out. Sometimes, I find a particular work that I want us to sing and I turn to my notebook for inspiration to help fill in the gaps in the programming. Sometimes, I get ideas for things that will inform the audience. Sometimes, I am just reminded of other things I wanted to work on. But it all starts with words in a notebook. It just has to marinate. What makes you different from other choral groups? We approach everything from a human point of view. All of our programs are trying to tell human stories. We’re not trying to prove anything. We just are. We’re creating programs that people can relate to. Like with “The Consolation of Apollo,” that’s about NASA’s 1968 trip around the moon and back. And a lot of the people in the audience remember that time. They were touched by the message and the use of actual transcriptions in the music, because they heard it or saw it when they were kids. It was touching for them. I think, for us, we’re special because we’re trying to give voice to our community and to the interest of our community through the music that we sing.